Let me introduce myself and tell you a little bit about me. I’m Nadene, but I am also known as mum, nanny, ducky, love but mostly by Deany. I’m fifty something, married for 40 years, have 3 grown up children in their 30’s and have a beautiful granddaughter aged 10 11 12 and 2 little Poochon girls (Bichon Frise x Toy Poodle) called Skinny Minnie & Crazy Maisie to complete my family. Although Minnie’s not so skinny these days but Maisie is still as crazy! I love all things crafty. It’s so easy to go and buy things off the shelf but nothing gives me more pleasure than when I can create it myself. 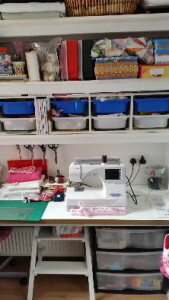 I love to have a go at everything, knitting, sewing, patchwork, painting, drawing, baking, recycling. I love it all. I’m not perfect at any of it, but I do get immense pleasure from creating something and I get quite a bit of assistance from my granddaughter Lola. I would love to share with you some of the things that I (we) create, hence the website. 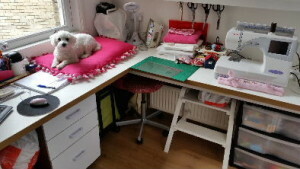 I love to make things for Minnie & Maisie so if you have a little dog too and you’re looking for ideas, hopefully my tutorials will help. It all started from my love of sewing and all things crafty. 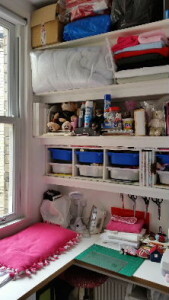 In that little room that my husband so lovingly created for me so that I could keep all my ‘mess’ in one room haha( photos below) I would spend hours in there doing what I love best …creating and have always yearned for my own business selling fabrics 🙂 but this is how my dreams have become a reality…..
Once upon a time, my son Andy came back home to live, after many years of working abroad. He decided to put down some roots and buy a property that he could renovate and get his teeth into. That property lay just at the back of our house on the promenade in Bridlington. The whole building was in great need of renovation and modernisation…….just what he was looking for. It was perfectly located too. Go straight out of our back gate, 10 strides down the alley and into the back gate of his property! Andy purchased the building and spent months stripping it down to the bare bricks. It was very damp, what wood wasn’t rotten was full of woodworm and basically everything but the party walls had to go! So that’s what he did……removed everything but the party walls…….and I mean everything!! He employed Derrick the best builder in Bridlington and with his vision and Derrick & his A team they set to work to start the renovation. Anyway….to cut a long story shorter, whenever anyone asked Andy what he was going to do with the shop, he always said that he didn’t know. This went on for months and months, people knocked on the doors during the refit asking what it was going to be, again, he either joked with them it was going to be a pole dancing club or he said he didn’t know yet. We (his family) thought he was probably going to rent it out. 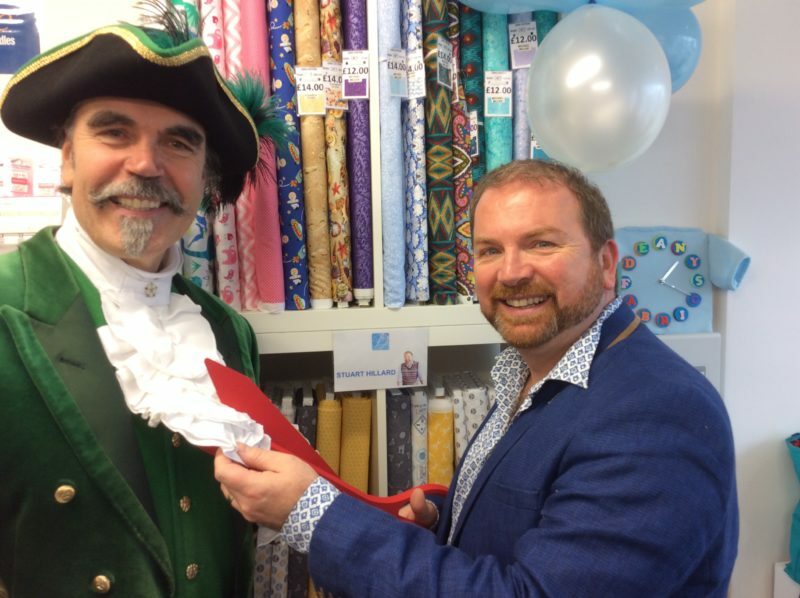 Well…..when all of the building work and new extensions were completed, that wonderful man that just happens to be my youngest son, handed me the keys and said ‘there you go mum, it’s your fabric shop’! Can you believe it! …… No I couldn’t either!! But here it is YIPPEE ….. Loved reading about your dogs. Dulcie (cat|) is not allowed in the bedroom but since he spent 3 days in animal hospital he does creep up in the day. He has to be shut in the kitchen because I had a dead mouse next to the kettle one day, and a dead pigeon in the kitchen which he had bought through the cat flap. He is behaving himself but much as I love him, a dead mouse with a cup of tea in the morning caused a lot of screams from me. We have always had dogs but thought a cat would be easier now we are OAP, but I am not too sure about that. I need to win some money cause that cat has cost me over £2,000, but I love him to bits. OMG ,! sorry I haven’t replied to your comment, Michael must have approved it and didn’t tell me! Cats are always bringing gifts for their loved ones, but I’m afraid I would react in exactly the same way as you……the whole entire neighbourhood would have heard my screams ha ha. We had a cat years ago and my daughter who was 7yrs old at the time woke me up screaming at 2oclock in the morning. She woke up with a dead pigeon on her pillow and it had obviously been dead for some time! The cat had climbed up on the porch and into her window that was slightly open. It hasn’t put her off though, she has two cats of her own now and wakes up to an army of dead mice laid out in a line on the front path quite regularly! Sandra, I understand your horror re the dead mouse. I am now in my 70’s and still totally rodent-phobic. I know all the platitudes about them being smaller than I and they won’t hurt you, but still, my toes curl up, I freeze and can’t breath properly. And, guess what? I was brought up on a farm!! Thankfully none of the cats we had ever brought ‘gifts’ into our home. Deany, the way your son presented you with your shop is wonderful and next time I’m in Brid, I’ll be in to browse and buy. 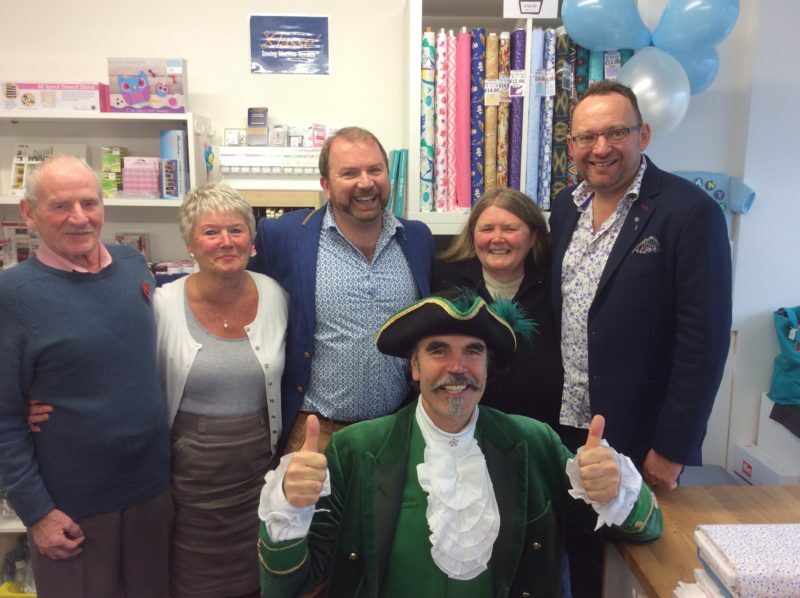 Congratulations on the shop opening! Lovely pics! All the very best for the shop Deany. 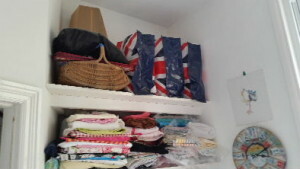 I belong to a knitting group in Northamptonshire and we make items for various charities ranging from blankets for rescue dogs through to outfits for prem babies and warm hats for sailors plus many more. Having been in and out of hospital myself for the last two years with one thing and another I can honestly say that knitting and crochet kept me sane as it is very difficult to concentrate on a book or even a newspaper or magazine when you are not feeling so good but with needlecrafts you can pick them up and put them down as and when you feel like it. So do keep up the good work and if I am ever in Briddlington I will certainly pop in. 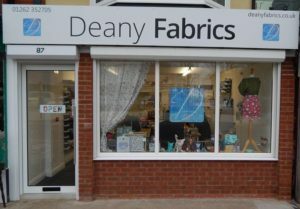 Good luck tomorrow the 4th of November on the opening of Deany Fabrics shop and hope goes well in the future for you. Thought this may be interesting (or not). My Uncle, who is not alive today, started as a tea boy for the Fleetwood Press. He worked his way up to sub editor before it was taken over by the Mirror Group (I believe). He wrote for comics, Knockout, etc. He wrote Goofy the Ghost, story about a friendly ghost as a child I was frightened of ghosts, but he said if people loved you when alive, they would always love you and not frighten you. Casper was based on this. He wrote Sporting Sam and many others. To get to the point, he went into his editor with a good idea, a magazine full of puzzles, and his editor laughed at him and said who is going to buy that. I think of him when entering my puzzles. No wins yet, but still wait for the post. One day I will get an answer before anyone else on your site, but they are so quick. Anyway I enjoy the puzzles, not too keen on the stories in some of the mags, so depressing. How lovely, and you have your wonderful memories of a very talented uncle. I must agree with you though about some of the stories, I hardly read them any more……bring back the happy ones I say! Fabulous shop and a lovely friendly helpful couple. I gave your business card to my work colleagues and they are very excited about a new craft shop to visit. Can’t wait to give my friend the furry cat pin cushion I bought from your shop on Saturday. I wish you all the success in the world. 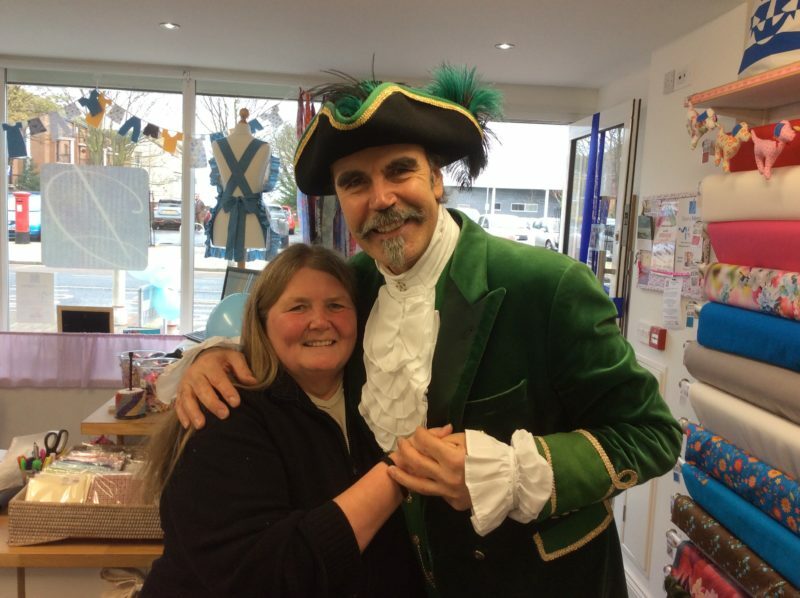 Oh wow what a wonderful.story and fab way to get started with your business… ive never been to the shop as live in leeds but will be in brid this weekend so will be sure to pop in! 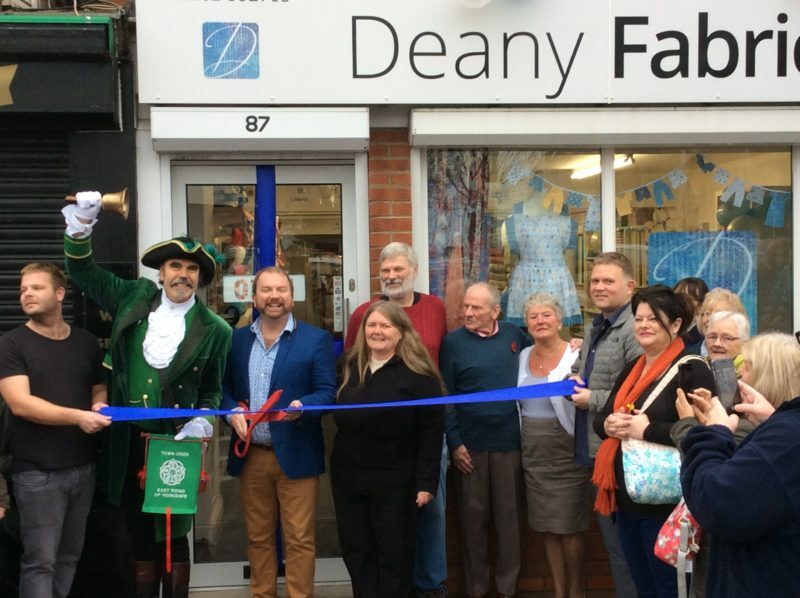 Oh Deany, what a wonderful story, what a fantastic son you have raised, when I read about this, I confess I had tears running down my face, warm wishes to you all, I do not do sewing, (only when I have to ) But I admire people who do, sew I mean, and my great granddad was a master tailor, I’m afraid that part of the family genes never got as far as me !! 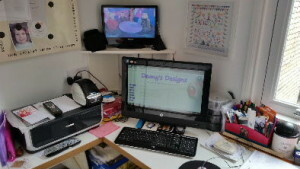 Very good luck all of you, June x.
Deany, the shop and the website look great. Your very welcome Deany. Touching wood as I speak in the hope of winning a prize sometime soon. Believe me or not but I did win the Mail On Sunday General Knowledge £1500 Prize Crossword a long time ago, and was well pleased with my winning cheque that came through the post. I still enter it every week in the hope of winning again. You never know! Thanks for wishing me luck. As far as I know, I seem to be the only person with an avatar photo on your website. As you can see I have an avid fascination of owls, which is why I have this photo. They are amazing majestic birds and I’ve always been interested in them. £500 is a really nice win, especially before Christmas time. That prize would help a lot when buying gifts, or even donating some of it to charity as well. It would make a huge change in my life should I ever win the National Lotto. Oh yes! Although the chances of winning that prize is very slim, but someone has to win it I guess.